I spent most of this morning walking along urban roads, and so it comes as a jolt of surprise to meet a tractor and realise I am now in a rural area. Newport industry is not far away. To my left is the narrow Ebbw River, its water hidden between steep banks, with the cranes of the Newport Docks beyond. As I continue walking along the farm track, the view of the docks gives way to a view of the two Uskmouth power stations. I was walking in the shadow of those chimneys yesterday. Considering all the miles I’ve done since then, I don’t seem to have travelled very far! The track ends in a flat area of wasteland. There are some vans parked and I keep my distance. Men in vans in the middle of nowhere? I don’t want to know what they’re up to. The Wales Coast Path follows a raised bank and veers round to the right. Despite being higher than the surrounding fields the bank is very, very muddy – and covered in cow pats. I can hear the mooing of cows coming from a nearby dairy farm. I’m just grateful they are locked up. The River Ebbw and River Usk have combined at this point to form a wide river mouth. On the other side I can see the Newport Wetlands Nature Reserve with its squat lighthouse, where I walked yesterday. And this bank has its own lighthouse too, the West Usk Lighthouse. The light has been decommissioned and the building is now a B&B. I stop to take a photo and spot something odd. A blue box. Just beyond the lighthouse I stop again, to take a photo of the view across the low-lying fields to the hills in the distance. The signpost informs me the Wales Coast Path follows the track at the bottom of the bank. But I don’t want to walk down there. I prefer to stay up on the higher ground where I can look over the river. I make rapid progress. The only thing that slows me down is the mud, but at least there are no more cow pats. The bank stretches ahead, curving slightly as I leave the mouth of the River Usk behind and begin following the course of The Severn. With the sun bright and low ahead, photography is difficult. But when I turn round, I take a photo that captures the spacious feel of this wide, marshy landscape. I’m elated because I’ve left the urban sprawl behind me and am walking through a space filled with so much light and air. After a mile or so of bank walking, I begin to see people strolling around near the shore. I must have reached a place called Lighthouse Park, near to the village of St Brides Wentlooge. Here there is a caravan park and a pub. It’s 1:30pm, and I stop for lunch at the pub, as planned. I was determined not to repeat my mistake of yesterday, when I found the only pub for miles around was closed. So I checked in advance and made sure this pub was open and serves food. But you can’t plan for every eventuality. When I ask for the menu the landlady apologises. The cook has called in sick. There is no food today. Disappointed, I fall back on my usual ‘make-do’ lunch. A packet of crisps and a packet of peanuts. To cheer myself up I order a pint of cider instead of a half and take my meal outside. It may be the beginning of November, but I’m warm in the sunlight. I have the garden to myself, and am just feeling nicely relaxed when my lunch is interrupted. 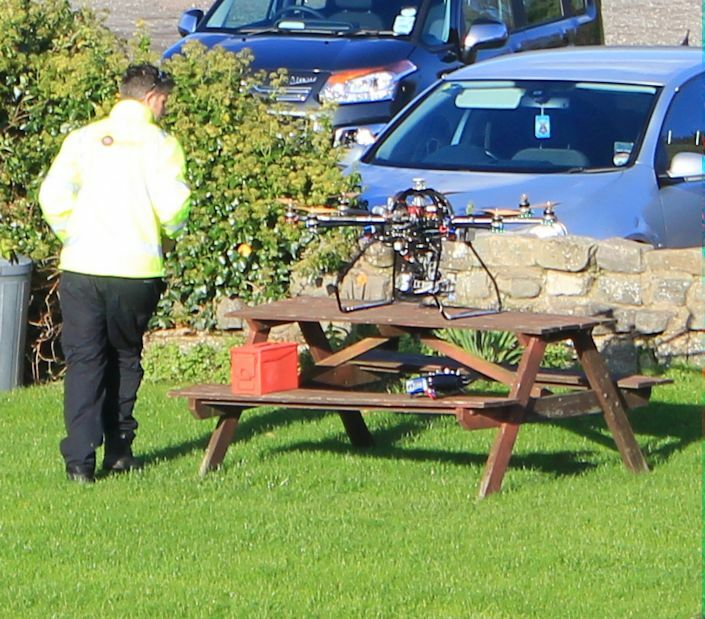 A man from the BBC has arrived and wants to launch a drone from the garden to do some filming of the coast path. I’m moved round to the front porch, but that area is in the shade and I begin to feel chilly. To add insult to injury, the man starts setting up the drone on my recently vacated and sunny table. Hurriedly, I finish my crisps and leave, but I hang around on the bank for a while. If the BBC wants to film the coast path, I might as well be in the shot, looking like a proper walker. But nothing much seems to happen and I decide I better get on. The sun is sinking lower and I have another couple of miles to cover before the end of my walk. Out in the Severn Estuary the tide is coming in. The mud makes dramatic patterns, with its furrowed ripples thrown into sharp relief by the slanting light. While inland some Welsh sheep are making the most of the last few hours of this sunny day. At least they get to eat uninterrupted. A little further on and I meet some cows. There isn’t much room on my narrow strip of land that runs between fields and river mud, and the cows have spread out to cover both the bank and the track below it. Oh dear! I screw up my courage and walk between them. They have enormous horns and shaggy coats. 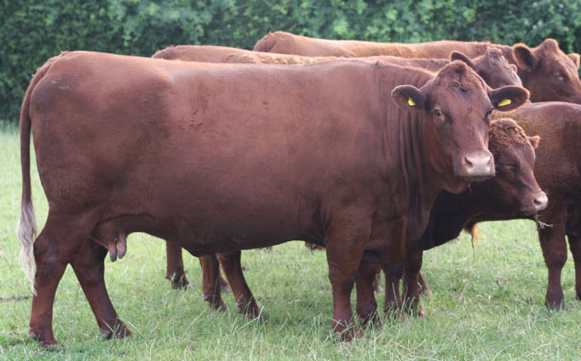 Are they Highland Cattle? In Wales? Despite their fearsome appearance, they are surprisingly small in stature and don’t show any interest in me. This one has a fine young calf. The path bends inland to navigate an inlet, called Peterstone Gout on my map. Here is where water drains from the Wentlooge Levels and into the Severn. I walk past some big pipes and around pools of water. A fenced off area of land has yellow triangle warning signs. 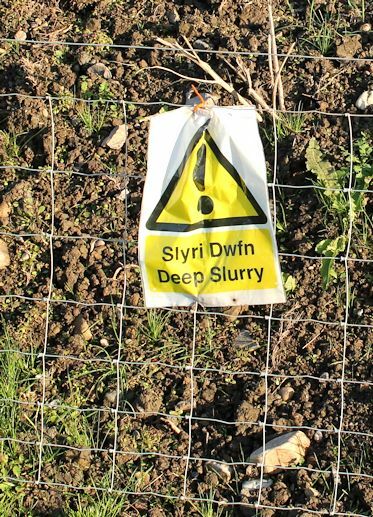 Deep Slurry! Then I walk through a field of horses. I’m less frightened of horse than I used to be. I’m relieved when I reach the fence at the end of the field and climb over a stile. But it’s not a proper obstruction. The fence on either side of the stile has collapsed. My companion pushes through and continues to follow me. Two other horses join us and we make a fine procession down the bank. I’m just beginning to wonder if I’ll be accused of stealing the damn animals, when they seem to lose interest and turn back. The low sunlight makes the landscape glow golden. On the other side of the river I can see Avonmouth docks and Portishead. I meet more cows. This one is definitely a bull, I think. The sun is very low now and I take a photo looking down the Severn. I wonder if I am still walking along a ‘river’, or if it has become an ‘estuary’. I reach a footpath leading inland to Peterstone Wentlooge, my destination for today, where I wait for my husband beside the church. The church seems odd. It has ‘Private, Keep Out’ signs and a locked gate. Not very welcoming. Later I learn it was deconsecrated and is now a private house. When my husband arrives on his bike he is in need of rehydration. Sadly, the only place we can find open for refreshments is the local pub! This entry was posted in 12 South Wales and tagged hiking, photography, travel, walking. Bookmark the permalink. You seem to be having some very bad luck with lunch. I think I’d be inclined to pack sandwiches. The horses mad me laugh. 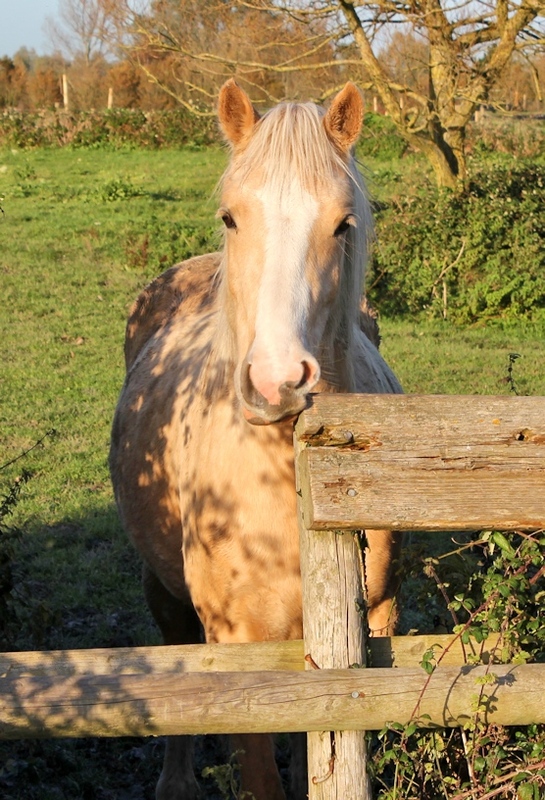 I’ve had a few New Forest ponies that are way too friendly. They scare me. I think they were hoping for food, or a ride. Way too friendly, but better than cows! We have those Highland cattle here on Arnside Knott and despite their fierce looking horns they seem to be quite benign. My route was more inland, and largely on roads. The Wales coast path had not been opened so I was not aware of the embankment route which is not shown as a public footpath on my OS map – it looks a much better route than mine. I continued mostly on roads to Cardiff, but I suspect your route will be better. I really enjoyed walking along the embankment. Shame the path wasn’t open when you walked this way. Hi Ruth – I hope you don’t mind me jumping in here to offer some help to commenter Leslie. There is a day by day account on my blog – conradwalks.blogspot.com which you can access from the chronological post list on the left of the opening page. I love the sight of all the hills and mountains that fill the background. I had to drive out to Chepstow last weekend (to help a friend) and the views are so inviting, I know I’ll have to start exploring Wales soon! I thought I was going to be accused of stealing those horses – they followed me for ages! I wouldn’t really recommend the coast walks in this area, Olly, but I did follow Offa’s Dyke for a section and I imagine that is lovely once you get up into the hills.. Or you can walk up the river from Chepstow – following the Wye Valley Walk – which sounds lovely too. Great read and lovely photos, Ruth. One small correction – the river west of Newport is the Ebbw (ends in ‘w’, which is a vowel in Welsh). Happy plodding! The horses made me laugh. I expect it was your rucksack that attracted them. Certainly the forest ponies have learned that bags are likely to contain food!